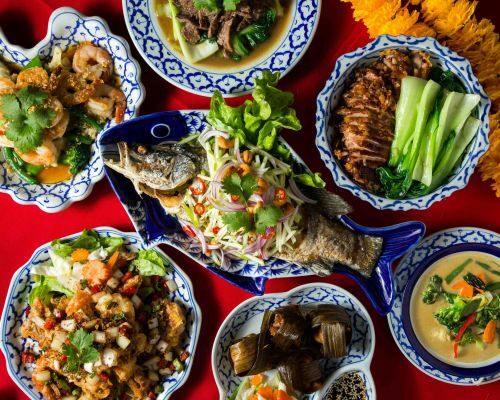 Menulog delivers for Baan Thai Restaurant so you'll be able to track your courier on a map. Spring rolls made with minced pork and Thai herbs. Spring rolls made with mixed vegetables. Marinated skewers topped with peanut sauce. Chicken spare rib marinated with turmeric. Fish patties made from fish meat, blended with curry paste, fine sliced green bean, kaffir leaves and egg. Made with minced chicken, sweet corn, baby pea and Thai herbs. Green curry paste cooked in coconut milk and vegetables. Red curry paste cooked in coconut milk and vegetables. Panang Curry. Choice of beef or chicken, cooked in a creamy red curry paste. Southern style curry with potato and onion, topped with cashew nut. Chicken with sweet tamarind curry and topped with peanut and spring onion. Massaman curry cooked in coconut milk with potato, onion and peanut. Duck cooked in coconut milk and red curry with pineapple, tomato and vegetables. Stir fried with onion, pepper and basil leaves. Stir fried with cashew nuts, onions, pepper and green chilli. Stir fried with garlic and black pepper topped with fried shallot and coriander. Stir fried with oyster sauce and fresh vegetables. Stir fried with Thai sweet and sour sauce and vegetables. Stir fried with chilli, onion and spring onion. Stir fried with red chilli paste and mixed vegetables. Stir fried with peanut sauce, vegetables, onion and curry powder. Stir fried with sweet black chilli sauce, onion, pepper, carrot and paprika. Stir fried with ginger, chilli and onion. Stir fried with lemongrass and chilli. Cooked with lemongrass and special tom yum sauce. Stir fried with basil, onion and chilli. Thai style fried noodles with crushed peanut, bean shoots, Chinese leek and egg. Stir fried thick rice noodle with egg, vegetables and special dark soy sauce. Stir fried thick rice noodle with egg, garlic, chilli, basil and vegetables. Phuket style stir fried egg noodles with vegetables and egg. Thai style fried rice with egg. Special fried rice with prawns and prawn paste. Pan grilled beef mixed with cucumber, lemon juice, onion, chilli, roasted ground rice and herbs. Minced chicken cooked in a sauce of lemon juice, onion, chilli, roasted ground rice and herbs. Squid cooked in a sauce of lemon juice, onion, chilli and herbs. Traditional Thai clear, sour and spicy soup.